The concept of adopting an animal from the local shelter, thanks to the ongoing support of mainstream athletes like Ryan Newman, is no longer a novel concept. Krissie Newman said she was impressed to see all of the work that Best Friends does for the animals. 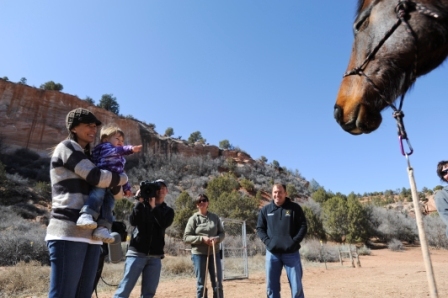 “It was an education experience for us, for what we are trying to do with our Rescue Ranch in North Carolina. Hopefully we can take some of the (Best Friends) practices back east with us,” she said. Ryan and Krissie signed autographs for local NASCAR fans, Best Friends employees and volunteers. 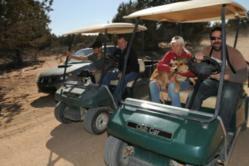 They toured the sanctuary animal care areas. They played soccer with a horse, took a cat on a leashed walk and doted on a puppy. But the highlight of the tour had to be the impromptu “golf cart drag race.” At the sanctuary, golf carts are used in the day-to-day work of caring for the canine residents in the sprawling “Dogtown Heights.” One of the caregivers challenged Ryan Newman to a race and Newman, with good humor, accepted the challenge. The two-person, one-dog race teams zoomed through a couple of laps on the road around several of the dog buildings. It was neck and neck, but Newman pulled ahead for the win in the end. Dogtown caregvier Haven Diaz elated at early lead but Ryan 'Rocket Man' Newman won in the endGolf carts are used in daily work at Best Friends Animal Society's Dogtown Ryan and Krissie Newman sign the harness of Cassidy, a three-legged rescued poodleAutograph session at Best Friends Animal Society NASCAR sent film crew to document the Ryan Newman family visit to Best Friends Animal SocietyFelix the horse greets Krissie Newman and baby Brooklyn while Ryan Newman lools on.